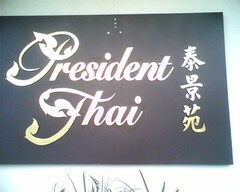 South of Colorado, down Rosemead, there's a great Thai place called President Thai. A friend of mine told me about this place a while ago and when I drove by last year the place was demolished and they were building anew. I don't know when they finished construction but they are open for business and the building looks fantastic and their logo is cool too. It looks like a smaller Wat Thai temple. They definitely spent some bucks in creating an environment that transports you to Thailand. 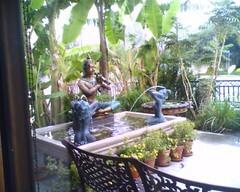 You'll find some fountains outside, patio seating, Thai artwork all over ...etc. And what about the food you say? I'm am happy to report that it was great. 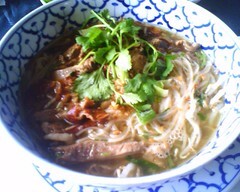 I went for lunch and got the Duck Noodle Soup and it was good. The broth was flavorful and the duck bits were tasty. Another item on the menu caught my eye so I also tried out the Chinese Greens with Fried Pork. This was great - the greens had so much flavor. 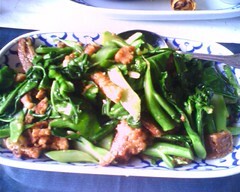 The fried pork were crunchy thick pork bits. The greens by itself was great picking up flavor from the pork, so it's up to you if you want the cholesterol or not from the pork. But if you bite into the fried pork, you won't be dissappointed. Will definitely be back to try some more dishes. I've been doing a lot on sweets lately, so why stop now? 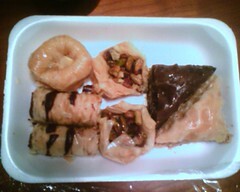 Right next to the Zankou Chicken in Glendale there is a place, Baklava Factory, that sells all sorts of baklava. Check out their website to see the variety. I swear they have more variety at the shop. They also have assortments of cookies and other pastries. There is so much there that its hard to decide what to get, so you may find the staff rolling there eyes at you. They aren't known for friendly customer service. Don't let that throw you off though, just concentrate and make your choices. They also have baklava platters if you need to take some sweets to a party/group event.